Recently Drumlines Of America was able to sit down and talk with Ben Pisani, director of Heat Wave of Florida, and get the inside scoop on the brand new drum corps hitting the sunshine state! “They took us off the streets…” That’s how Pisani described getting his start with drum corps as a kid in New Jersey. To him, this activity is about giving the children a positive outlet and a place to grow, and that’s exactly what his new corps is all about. That’s also why Pisani chose DCI over DCA for this new venture, junior & cadet corps will give him and his staff a chance to focus on a younger crowd. After the folding of Teal Sound, many saw a void of a formidable corps that young people in Florida could turn to. Pisani is stepping up to the challenge with Heat Wave of Florida! 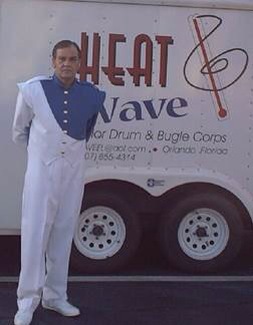 Not to be confused with the former drum corps, Heat Wave of Orlando. Pisani says that he is not trying to revive, but honor Florida’s drum corps history with the name. He says this corps is going to “take things slow and do it the right way.” Pisani doesn’t want to financially burden the new corps and bring it to an early demise like so many others we have seen in the past. He believes showing the kids that building a solid foundation is important will not only effect the drum corps world, but Florida as a whole. A corps for the kids, a corps for the state, Heat Wave of Florida! For information on becoming apart of Heat Wave of Florida you can join them at their next camp on January 24 at Inverness Middle School or visit them on the web at www.HeatWaveofFlorida.com.